Posted by Product Review Team in Fish Feeders and Pond Management on March 07, 2016 . 1 Comments. There are many aspects of a healthy pond with good fish populations, and making sure your fish are fed is no exception. The biomass of fish (overall weight of fish) in your pond is determined by factors such as surface area of your pond, water quality, vegetation in your pond, appropriate numbers of bass and bluegill, ph balance, and an ample supply of food for the fish to eat. Ideally, they healthier your pond, the bigger and healthier your fish. 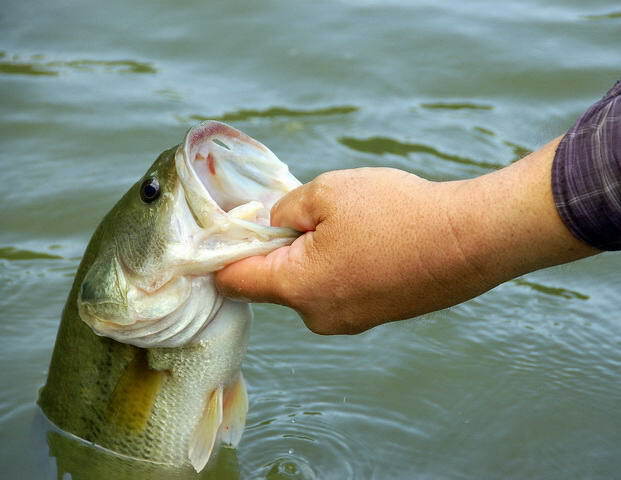 According to Michael Porter at Noble.org, "Most unfed and unfertilized impoundments in this area containing both largemouth bass and bluegill have 15-75 pounds of bass per surface acre, but their overall range of bass biomass is approximately 0-174 pounds of bass per surface acre." So the question is, how do I get more big bass in my pond? We will explain how to do this with proper pond care and with the help of fish feeders, artifical habitats and even turtle traps. Have your water tested. Texas A&M offers water testing for a fee, you can download the -- submission form here -- (link to http://soiltesting.tamu.edu/files/waterweb1.pdf), Making sure you have good quality water is the first step of making sure you have a good habitat for your fish. These water tests can tell you the next steps to creating a good habitat for your fish. Making sure you have the right amount of vegetation in your pond will create a filter for the water, give protection to fry and other small fish making their chances of survival greater, and gives you a better habitat for your bass. Fertilization helps keep the food chain in check from microscopic plants (phytoplankton) which is eaten by zooplankton, which is consumed by fry, which is consumed by larger fish. For more information on pond fertilization, click here. Keeping your pond stocked with the right ratio of bluegill to bass will help keep a steady food source for the bass. Normally, bass will eat 5 to 6 pounds of bluegill to gain 1 pound of mass. Keeping enough bluegill in your pond as a food source for bass is not always as easy as it sounds. One way to help the bluegill grow before being consumed is to use a fish feeder on your pond. We will discuss this a little bit later in the article. Consult your local fish hatchery for a stocking schedule for a pond your size. Catch and Release...Most of the time. Too often we hear that a customer has plenty of fish in his pond, but all he ever catches is 10"-14" one pounders. While a 12" one pounder might be a healthy fish, if you have too many of them in your pond, they will be competing for the limited food that is available to them. It is recommended to occasionally pull some of these 10-14" fish from your pond. A good rule of thumb is to remove 10 lbs per acre a year, but that might vary depending on the biomass of fish in your pond. This will reduce the number of fish competing for the limited food, and the ones left will be able to consume more and become larger. Combining this with a stocking schedule and supplemental feeding with a fish feeder will help those fish grow into lunkers! I want my bass to grow larger, why would I feed my baitfish?? All living creatures rely on reproduction to maintain their existence. This goes the same with baitfish. Using a feeder to feed your baitfish will allow them to grow, reproduce and eventually generate more food for your bass. Feeding bluegill will also make a larger meal for a bass in time. Automatic fish feeders are a great way to automatically supplement the food source of your fish. Fish will not eat the fish food as a primary food source, but will support the existing food supply available to the fish in the pond. We recommend using one fish feeder per acre, and feeding twice a day, once in the morning and once in late afternoon. Only feed what the fish will eat in 10-15 minutes. If you have food floating to the shore and not getting consumed, you can cause problems to the health of your pond. If the fish are not eating all the feed, turn down the amount of time the feeder is running. If they gobble up the feed in a couple of minutes, consider feeding a little longer. There are a few things to consider when buying a fish feeder; Feeder Capacity, Mounting Options and How Many Feeders You Should Use. Fish feeders vary in size from 5 gallon buckets up to 55 gallon barrels. Depending on how much feed you plan on feeding and how often you want to fill the feeder will determine the size of the feeder(s) you should get. Also consider where you are going to place your feeder. It might not make sense to put a 55 gallon drum on a 10'x10' dock. There are several mounting options for feeders, and it is important to know where you are going to place the feeder before you purchase one. There are basically three types of feeders, free standing, post mount, and hanging. Free standing feeders take up a larger footprint, and usually work better if placed on the bank, but can also be used on a dock if desired. Post mount feeders can be mounted to a 4x4 post and usually hang on the side of your dock so you do not loose any square footage on the dock. Hanging feeders tend to be the smaller feeders but have many mounting options from plant hangers to hanging them in a tree. Decide where you want to put your feeder, then make the choice of which type of feeder to purchase. Many poeple ask us how many feeders they should put on their pond. This depends on the size of the pond and the number of fish in your pond. We recommend an average of 1 feeder per acre, but if your pond is stocked full of fish, you might want to increase that number. Fish feeders are a suplemental feeding mechanism and are not designed to be the only thing your fish eat. To spread out the feeding areas, we recommend placing a feeder on each end of a 2 acre pond, and evenly spreading them out if you are using more feeders. Evenly spread out feeders keeps the fish 'local' and allows all areas of the pond a chance to feed on the food. We recommend using a solar panel and rechargeable battery with your fish feeder. This will keep your feeder running smoothly without interruption. Once you place your feeder, you want to mount your solar panel on the South side of your feeder. The South side gets the most sun and these solar panels need full sun for a good part of the day to keep up with demand. Solar panels are only good for charging a battery, and the battery is what runs the feeder. If you are only using one feeder, try to position the feeder so it is upwind from the pond. This way, the feed will not get blown back to the shore, but instead it will travel across the pond until it is eaten. We recommend feeding twice a day, once in the morning and once in the late afternoon. Only feed as much food that will get consumed in about 10-15 minutes. Throwing more food that is not eaten can cause bacteria problems for your pond. Most feeders have a test button. Test your feeder everytime you go to the pond, just to make sure everything is working. If placing your feeder on the bank, use come concrete pavers or similar to let the feet rest on. This will keep your feeder from sinking into the bank. Place your feeder as close to the pond as possible. This will keep the food in the pond and not on the ground. Store your feeder. If you do not feed year round, store your feeder in a shed or barn, Remove the electronics and store them inside, charge your battery and only store it with a full charge. Most small ponds do not have enough cover for the fry and smaller baitfish. Creating a habitat for them is as easy as throwing an old christmas tree in the water, or using one of many artifical shrubs/trees like the Honey Hole Shrubs and Trees. Another issue with ponds is they get overrun by turtles. Turtles will eat your fish and can cause problems when trying to grow a healthy fish pond. We recommend using a turtle trap to catch and remove these turtles. You should use a floating turtle trap over a sinking one for several reasons; 1. Floating Traps will not drown the turtle. 2. You can see when you have a turtle in your trap withouth pulling the entire trap to the surface. 3. You don't have to always bait the trap (but it does help). Floating turtle traps capture turtles when they climb on the unit to sun themselves. They climb on the platform and when they get to the top, the hinged platform dumps them into the basket where they can not climb out. I you notice many turtles in your pond, you might consider adding a turtle trap to your set up.